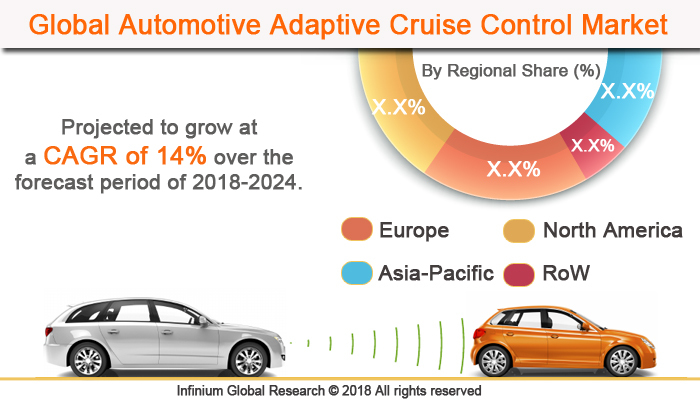 A recent report published by Infinium Global Research on automotive adaptive cruise control market provides an in-depth analysis of segments and sub-segments in the global as well as regional automotive adaptive cruise control market. The study also highlights the impact of drivers, restraints, and macro indicators on the global and regional automotive adaptive cruise control market over the short term as well as long term. The report is a comprehensive presentation of trends, forecast and dollar values of the global automotive adaptive cruise control market. According to the report, the global automotive adaptive cruise control market is projected to grow at a CAGR of 14% over the forecast period of 2018-2024. Adaptive Cruise Control (ACC) is an automotive device that allows a vehicle's cruise control system to adapt the vehicle's speed to the traffic environment. A radar system attached to the front of the vehicle is used to detect whether slower moving vehicles are in the ACC vehicle's path. If a slower moving vehicle is detected, the ACC system will slow the vehicle down and control the clearance, or time gap, between the ACC vehicle and the forward vehicle. If the system detects that the forward vehicle is no longer in the ACC vehicle's path, the ACC system will accelerate the vehicle back to its set cruise control speed. The adaptive cruise control system is fuel-efficient and trending technology. The growing need for passenger safety drives the huge growth in the automotive adaptive cruise control market. With rising consumer demand for safety solutions, the demand for the automotive adaptive cruise control system is increasing. Moreover, increasing the sales of passenger cars has accelerated the growth of the adaptive cruise control market. The increasing numbers of accidents have led to the adoption of the adaptive cruise control system, Furthermore, the increasing disposable incomes and greater sales of premium and luxury cars is a major factor driving the growth of the global adaptive cruise control system market.H owever, the high cost of system is hampering the growth of automotive adaptive cruise control market. Moreover, advanced technologies in autonomous vehicles are expected to provide beneficial opportunities for the automotive adaptive cruise control market. Geographically, the North America region is expected to dominate the adaptive cruise control market during the forecast period owing to the increase in vehicle production and stringent government regulations for the safety. The Europe region is expected to be the second largest region. In addition, the Asia Pacific region and Middle East and Africa region are anticipated to dominate the market in the forecast period. The report on global automotive adaptive cruise control market covers segments such as technology, mode of operation, vehicle type, and distribution channel. On the basis of technology, the global automotive adaptive cruise control market is categorized into radar, lidar, laser, and ultrasonic. On the basis of mode of operation, the global automotive adaptive cruise control market is categorized into normal adaptive cruise control and connected adaptive cruise control. On the basis of vehicle type, the global automotive adaptive cruise control market is categorized into passenger vehicle and commercial vehicle. On the basis of distribution channel, the global automotive adaptive cruise control market is categorized into original equipment manufacturers and aftermarket. The countries covered in the North America region include the U.S., Canada, and Mexico; while the Asia-Pacific region includes countries such as China, Japan, India, South Korea, Malaysia, and among others. Moreover, Germany, U.K., France, Spain, and Rest of Europe are the major markets included in the European region. The U.S. drives the growth in the North America region, as it is the largest market in the region. In the Asia-pacific region, rapid industrial growth in India and China offer substantial potential for the growth in the automotive adaptive cruise control market. As a result, the APAC region is projected to experience growth at a CAGR of x.x% over the forecast period 2018-2024. The report provides profiles of the companies in the global automotive adaptive cruise control market such as Continental AG, Delphi Technologies, DENSO CORPORATION., Autoliv Inc, Magna International Inc., WABCO, Robert Bosch GmbH, Knorr-Bremse AG, Mobileye, MANDO-HELLA Electronics Corp, Continental AG, and Delphi Technologies. The report provides deep insights into the demand forecasts, market trends, and micro and macro indicators. In addition, this report provides insights into the factors that are driving and restraining the global automotive adaptive cruise control market. Moreover, The IGR-Growth Matrix analysis given in the report brings an insight into the investment areas that existing or new market players can consider. The report provides insights into the market using analytical tools such as Porter's five forces analysis and DRO analysis of automotive adaptive cruise control market. Moreover, the study highlights current market trends and provides forecast from 2018-2024. We also have highlighted future trends in the automotive adaptive cruise control market that will affect the demand during the forecast period. Moreover, the competitive analysis given in each regional market brings an insight into the market share of the leading players. This report will help manufacturers, suppliers, and distributors of the automotive adaptive cruise control market to understand the present and future trends in this market and formulate their strategies accordingly.